Like Word Games? Think you’ve got what it takes to decipher Word Puzzles? Then get ready to be Wuzzled! • 10 amazing levels of word pun fun that will keep you hooked for hours and guess what? It’s absolutely FREE! 3. Reveal Answer: Use this when you just can’t figure out the answer – we hope you don’t have to but it’s there – just in case! • Still stuck? Don’t worry, you can ask your friends on Facebook, Twitter and Instagram for help or get more random ideas for words by simply shuffling around the letters with the “Shuffle” feature. 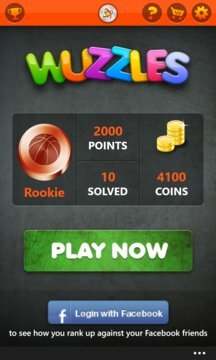 • Earn coins and stars and unlock a variety of funky achievements. • Solve more Wuzzles and earn new badges to show your friends how many you have solved. • Score points and move up the leaderboard to compete with your friends. 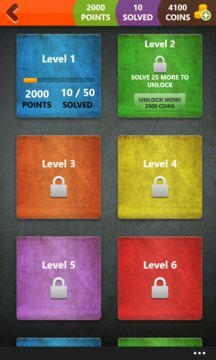 • Conquer the Wuzzle world and become a “Wuzzle Legend” by unlocking all the special achievements. There’s mystery waiting for you behind every Wuzzle. So what are you waiting for, download and let’s get started. Hours of wordplay fun awaits you.